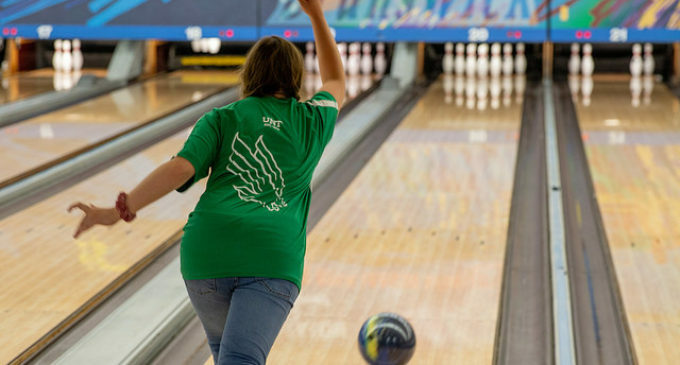 The North Texas bowling club was once successful at a competitive level, but after losing some upperclassmen to graduation, members are now looking to get back on top by the end of their season. The club is in the middle of its 2018-19 season and currently in between tournaments. The club competes in the Southwest Intercollegiate Bowling Conference (SWIBC) against other schools across the U.S, and earlier this month, the bowling team went to Wichita, Kansas, to a compete in a Tier One tournament, a separate system from the SWIBC. For SWIBC tournaments, the first day has five full games and 16 Baker games, and on the second day, there are seven full games. A Baker game is a different form of scoring where five athletes bowl two frames each, with the anchor having to fill the 10th frame. Every athlete must bowl a strike in each frame in order to complete a Baker game. Tier One tournaments have six full games for one day and over 20 Baker games on the next day. “To prepare for the tournaments, we just bowl on sport shot -— a heavier oil pattern that makes it a little more difficult to bowl in — and we take the averages divided by that game and that shows who goes to the tournament,” club vice president Tanner Stevens said. The team has been gradually improving despite obstacles and after having to rebuild its lineup. North Texas is starting to see better results throughout their tournaments this year. The SWIBC is a gateway to more competitive forms of the sport, such as the Professional Bowling Association (PBA), a life-long dream for some of the bowlers on the team. North Texas will be competing in the Jayhawk Collegiate Challenge this upcoming weekend at the University of Kansas.